Around 1968, Krishna Das met with the Indian guru Neem Karoli Baba, also known as Maharaj-ji. After three years in his ashram in India, Maharaj-ji guided Krishna Das to go back out into the wider world and sing ‘kirtan’ (chanting the Divine Names). 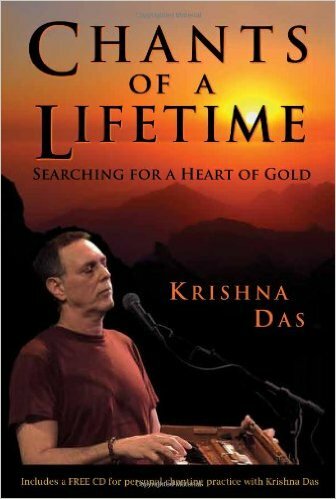 In 2010 Krishna Das wrote a book about his understanding of spiritual life and his processes in following this guru’s loving guidance. The quotes used in this writing are from KD’s book “Chants of a Lifetime: searching for a heart of gold.” A book that I found to be an absolute gem; simple to understand, while being quite profound in the gifts it offers. K. D. celebrates, that in time he came to realise that there was “no sense dressing up” who he was, and that he had to learn to look inside to find out who he truly was, and not “try” to act the part. To let go of trying, and to instead, honestly be. K.D. suggests that we have forgotten that there is “shelter inside our own hearts,” (44) and through chanting, we can uncover the happiness, the beauty, and the love, (45) that is always inside of us. Teachers for thousands of years have offered many ways to bring our attention to the fact that our mind is mischievous. The “lower mind” also known as the “monkey mind” will entertain itself through being wayward, creating stories as it goes; inventions that do not truly represent the character or overall intentions of who we are or want to be, yet if not directed, will otherwise take us on its own chaotic way. Krishna Das offers that chanting is one way to bring us back, to draw us into a deeper space, so we can “sit more at ease” in ourselves. (51) He speaks of how, despite his chanting practice, his mind would still wander. Over time, the continued repetition of the Holy Name “naturally got sweeter” and he found the enjoyment of that drew him further in. One of the positive effects of chanting is in its opening us once again to the essence of our being; that we are more than our minds and more than our personalities. Chanting the holy Names connects us yet again with the direct experience of feeling ourselves as love and spirit. Krishna Das offers that the “bottom line” is that we find our way in life by “following what makes us feel good.” (76) “We’re limited by what we believe about ourselves,” (78) but we can go beyond this limitation through surrendering into love. Krishna Das offers the lovely thought that “God lives inside of us as who we really are.” (229) In being who we truly are – in acting out of loving kindness – in singing the holy names – we come to clear away the dust that covers our hearts and realise the joy and beauty of being love – of reconnecting with our sacred ‘Self’ – of being Love Itself. Sat – Cit – Ananda (Eternal Bliss Consciousness). Reference: Chants of a Lifetime: searching for a heart of gold. (2010) Krishna Das, Hay House, U.S.A.